"We believe that healthy buildings are the foundation for strong and vibrant neighborhoods. Our work has been called adaptive reuse, mill renewal, restoration--we call it building history for a sustainable future." Well, you can call it whatever you want but Monarch on the Merrimack is the real deal! Mass Innovation took a run down mill and converted it into 600 eco-luxury lofts. 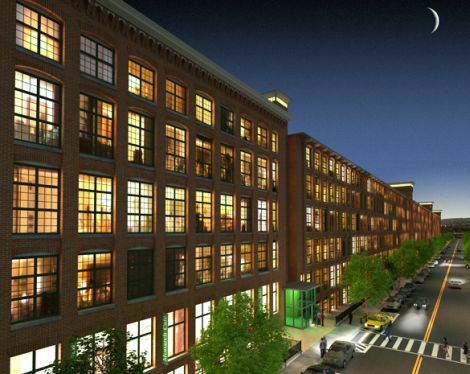 Over a 1/3 of a mile long, the mill, located on the riverfront in Lawrence, MA, is now New England's largest eco-luxury development. Once regarded as an industrial city outside of Boston, Lawrence is turning green, spearheaded by the Monarch development. Well, St. Louis is bringing it...bringing urban, green living to downtown. The SkyHouse (at 1428 Washington Avenue, St. Louis) represents the first residential building to go up in downtown St. Louis in over 30 years. 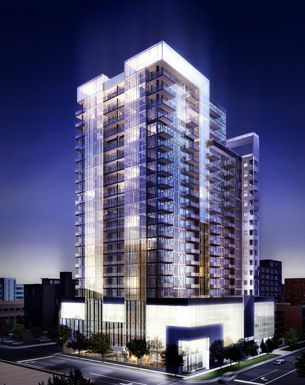 Its is a 22-story glass structure that will be LEED-certified. There will be 12,000 square feet of commercial space on the first floor, 3 levels of parking, 3 levels of penthouses, and 166 condos on floors 5-18. One cool thing about the SkyHouse is that floor 19 will be exclusively for the residents. It will have a green space, dog run, media room, conference room, workout facility, sun deck with lounge chairs surrounded by a green roof and other places to just hang out. The building will also be built with energy efficient, high speed elevators. 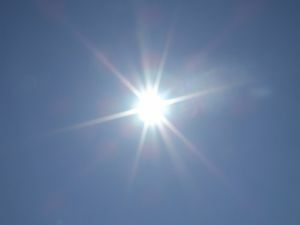 Its time we give props to our northern neighbors. 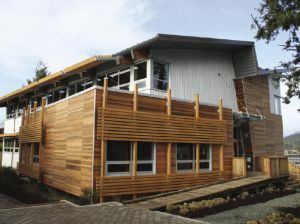 The first LEED Platinum building was designed by Larry McFarland Architects. This building is cool because it is uses building positioning to take advantage of solar and geothermal heating. 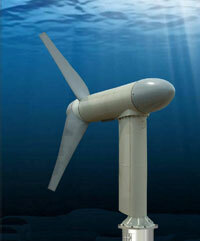 Ocean water is pumped through the building and heat is extracted to warm the building. The building has solar panels on the roof...I have posted a silhouette of the building and you can see how the building's position was strategically developed to take advantage of as much sunlight as possible. The building uses 1/4 the energy of a "conventional" building, resulting in a 33.3 ton reduction in CO2 emissions. Bike racks, drought resistant plants, dual flush toilets, CFL's, photosensors and occupancy sensors to control lighting and energy usage, exterior sunshades used for cooling, radiant heating, 30,000L underground water recycle tank for rainwater and greywater...all of this has come together to make this Canada's first LEED Platinum. If You Want A Big Home In Boulder, You Will Have To Pay For It! In order to curtail house-size growth in Boulder County, residents may be facing huge restrictions on the size of home the county will allow them to build. 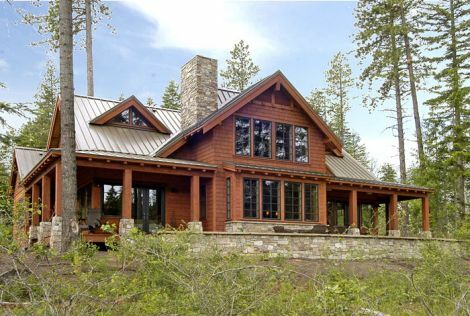 Based on 2006 building permits, the average size of new homes is around 6,290 sq/ft. Under the current proposal, homes built on the plains would be limited to 4,000 sq/ft and homes built in the foothills would be limited to 2,600 sq/ft. But there's a caveat! Under the new proposal, you can build a home that is larger than the square foot limitation provided you buy development rights that preserve rural land somewhere else in the county, which could add up to a large chunk of change. "It's clear in our view that this ever upward trend in consumption, consumption, consumption is not sustainable, and we don't think it's unreasonable to put some checks and balances in place." Thanks to Melissa Lafsky at the freakonomics blog for the heads up on this one. If you have never checked out that blog, give it a look sometime. Happy 4th of July and God bless our troops! Hope everyone has a relaxing day! Came across some cool pictures of a Hive Modular home this morning. It's their X-Line model and they had firm Rosenlof Lucas do the landscape architecture. Hive uses a modular construction system, which reduces the overall build time of a structure, improves quality control and reduces actual construction time. When you look at one of their X-Line models, everything has a built-in, maintenance-free/worry-free type of feel. 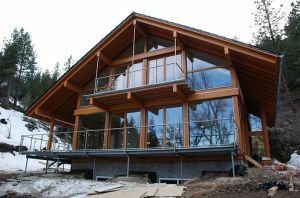 Due to location constraints, pricing on a structure can differ...$140 per sq/ft in the Midwest versus $200 per sq/ft west of the Rockies for a complete turn-key modular home sans design, delivery and setting costs. $200 per sq/ft still isn't that bad considering the quality that you are receiving. 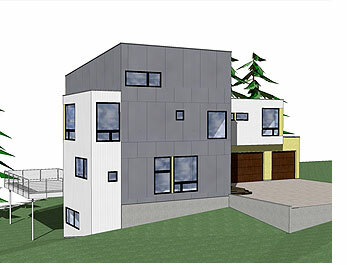 Hive Modular is one of the best prefab, modular companies out there...especially for the price. Wired and LivingHomes have come together for quite the collaboration. 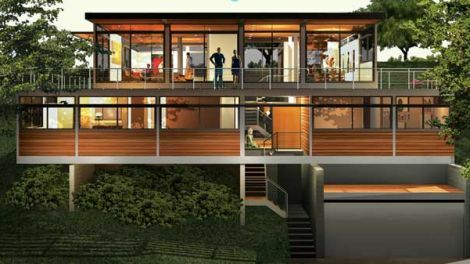 They are going to build a 4,100 square foot, $4 million, LEED, green, prefabricated, luxurious home. Right now on their website, they have a video featuring LivingHomes founder Steve Glenn. He talks a little about the Wired Home and some of its features. Not only are they going to build a pretty sweet house, they are deconstructing the previous structure, reusing what they can for the Wired Home and then donating what they can't use to Habitat For Humanity. The home is in L.A. and has some rocking views. Once completed, its going to be pretty impressive. 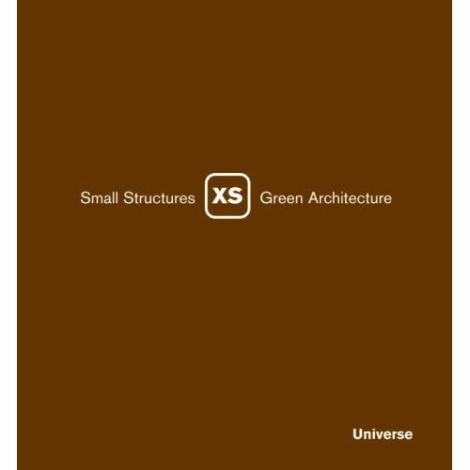 There is a cool, new book out about small structures and green architecture. I picked it up on Saturday at Borders and it has some interesting stuff in it. Written by Phyllis Richardson, it covers 40 or more small, green, prefab structures. From the Mirador in Chile to the greening of Detroit Pavilion, there are tons of pictures and a write-up on each structure.